ww2dbaseOn 26 Jan 1943, the US Navy's twelfth Essex-class aircraft carrier was laid down at the Fore River Shipyard in Quincy, Massachusetts, United States as the Ticonderoga. One week later, the thirteenth Essex-class was laid down at Newport News, Virginia, United States as the Hancock. On 1 May 1943, the names of the two ships were switched and construction continued on the Hancock at Quincy and on the Ticonderoga in Virginia. The name Hancock was meant to honor John Hancock, signer of the Declaration of Independence and prominent Boston businessman, which was part of why the names were switched so that the Hancock would be made near Boston. ww2dbaseHancock (CV-19) was launched 24 Jan 1944 and commissioned 15 Apr 1944 with Captain Fred C. Dickey in command. After fitting out and shakedown off Trinidad, Hancock departed Boston 31 Jul 1944 for the Panama Canal, San Diego, and Pearl Harbor arriving at Ulithi Lagoon on 5 Oct 1944 to join Admiral William Halsey's Third Fleet just in time for the Leyte Campaign. ww2dbaseLeading up to the Leyte landings, Hancock and the rest of the fleet struck airfields on Okinawa, Formosa (Taiwan), and Luzon. On 23 Oct 1944, three days after Douglas MacArthur's landing on Leyte, Hancock and the rest of her Task Group received orders to break off their refueling and replenishment near Ulithi and return to the Philippines to begin searching for the Japanese fleet that was reported to be approaching from the west. Hancock arrived off the Philippines just after the heroic Battle off Samar but in time to help chase Kurita's Center Force back through the San Bernardino Strait. Hancock planes struck shipping in the Sibuyan Sea and airfields on Luzon. On 17 Nov 1944, she became the flagship of the Fast Carrier Task Force when Vice Admiral John McCain came aboard. ww2dbaseLeyte operations marked the beginning of the Japanese airborne special attack doctrine (kamikaze) and Hancock withstood several such attacks. On 25 Nov 1944, the fleet endured a particularly fierce attack that saw Hancock gunners shoot one plane literally to pieces as it was diving on the ship. Large sections of the airplane landed on the flight deck but caused minimal damage. ww2dbaseHancock was part of the effort to suppress the special attack aircraft through attacks on their air bases which were mostly on Luzon and Formosa. These suppression raids were increased in Dec 1944 as MacArthur's forces were preparing for their landings on Mindoro. ww2dbaseThe fleet sailed through Typhoon Cobra in Dec 1944 but Hancock was lucky and suffered no damage despite the fact there had been waves breaking over the flight deck. She put into Ulithi 24 Dec 1944 and got underway six days later for more attacks on airfields and shipping in the northern Philippines and Formosa. On 10 Jan 1945, Hancock and the rest of the Task Force steamed around the north end of the Philippines and into the South China Sea. On 12 Jan 1945, Hancock took her place in the massively successful strike against Japanese shipping along the French Indochinese coast (Vietnam). The Task Force then struck the southern Chinese island of Hainan and Hong Kong harbor before exiting the South China Sea. ww2dbaseOn 21 Jan 1945, a TBM Avenger returned to the ship from a morning strike on Toshien Harbor, Formosa (now Zuoying, Taiwan). The torpedo bomber made a normal landing but as it taxied forward, one 500-pound bomb (and possibly two) fell out of the bomb bay and exploded against the flight deck. The airplane was destroyed and a hole was blown through the flight deck, through the Gallery deck below, and into the Hangar deck below that. 50 men were killed and another 75 were injured. The fires were quickly brought under control in time to land other planes that were still aloft. ww2dbaseHancock reached Ulithi on 25 Jan 1945 where Vice Admiral McCain left the ship as Halsey's 3rd Fleet staff rotated out and Raymond Spruance's 5th Fleet staff rotated in. Air Group 7, who had been with Hancock since she was commissioned, also rotated out and Air Group 80 came aboard. Hancock sortied with the ships of her task group on 10 Feb 1945 and launched strikes against airfields in the Tokyo area on 16 Feb 1945, the first carrier based air attacks on the Japanese home islands since the Doolittle Raid almost three years earlier. During that day, Air Group 80 flying from Hancock shot down 71 enemy planes in aerial combat, the greatest single day total for any Navy squadron before or since. Hancock's planes also struck air bases and other installations on southern Honshu, Chichi Jima, and Haha Jima. The purpose was to isolate Iwo Jima from air and sea support before Marines landed on 18 Feb 1945. Hancock then took station off Iwo Jima to provide tactical support for four days, hitting enemy airfields and strafing Japanese troops ashore. ww2dbaseHancock took another swipe at the Japanese home islands and then Okinawa before returning to Ulithi for replenishment. Air Group 80 rotated off Hancock and Air Group 6 came aboard. Raids against Japan continued as did the Japanese resistance. On 20 Mar 1945, a special attack aircraft dove on Hancock as she was refueling the destroyer Halsey Powell. Again, Hancock's gunners disintegrated the airplane when it was still 700 feet overhead but its bomb and large pieces rained down on both ships. That same day, Hancock gunners shot down another Japanese plane overhead as it was reaching its bomb release point. Leading up to the Okinawa landings on 1 Apr 1945, strikes against targets in southern Japan intensified. Hancock airplanes also flew close air support missions in support of the invasion troops on Okinawa. ww2dbaseOn 7 Apr 1945, Hancock was attacked yet again by a special attack aircraft. Again the gunners shot the plane to pieces but this time the plane was much closer to the carrier. The airplane's 500-pound bomb went through the flight deck near the port catapult as the aircraft itself struck the flight deck farther aft. The bomb explosion forward set planes on fire on both the flight deck and the hangar deck. The Japanese aircraft cart wheeled across the deck and struck airplanes spotted aft, setting them on fire as well. Crews worked quickly, courageously, and efficiently but it was still an hour and a half before the fires were fully extinguished. 62 sailors were killed and 71 were wounded. ww2dbaseThe damage was sufficient for Hancock to withdraw for repairs but minor enough for the work to be done at the more forward shipyard at Pearl Harbor. Hancock spent a month as a training carrier operating from Hawaii before striking Wake Island on 20 Jun 1945 on her way back to the Philippines. Hancock's aircraft participated in the crippling strikes against the Japanese fleet at Kure, Japan in late July 1945. The general pounding continued until orders were received to cease all offensive action on 15 Aug 1945 following Japan's surrender. Even after these orders were given, Hancock planes fought off an attack from Japanese fighters and also attacked one Japanese torpedo plane that was diving on a formation of British ships. ww2dbaseIn the days following the surrender, bombing missions continued – but this time they were dropping relief packets into prisoner of war compounds in Japan. ww2dbaseWhen the formal surrender ceremony took place aboard USS Missouri, Hancock's planes flew overhead. The carrier entered Tokyo Bay 10 Sep 1945 and sailed 30 Sep with 1,500 passengers for California. Hancock was fitted out for "Magic Carpet" duty and made two crossing bringing over 7,500 more servicemen back to the United States and two Air Groups of replacements westward to Saipan. She then sailed for Puget Sound, Washington to await deactivation. Hancock was decommissioned 9 May 1947 and placed in reserves in Bremerton, Washington, United States. 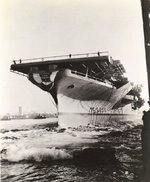 ww2dbaseOn 15 Dec 1951, Hancock began modernization work and was recommissioned 15 Feb 1954 as an Attack Carrier (CVA-19) with Captain W. S. Butts in command. From 1954 to 1975, Hancock was in and out of shipyards for overhauls and upgrades and back and forth across the Pacific for Western Pacific Cruises, including several combat deployments in the Vietnam War. ww2dbaseIn Mar 1975, Hancock offloaded her Air Wing and replaced the airplanes with heavy lift helicopters. The next month, those helicopters were used in the evacuation of Phnom Penh, Cambodia and then Saigon, South Vietnam (now Ho Chi Minh City, Vietnam). ww2dbaseSoon after Vietnam on 30 Jan 1976, Hancock was decommissioned and sold for scrap. Over her long career, Hancock was awarded the Navy Unit Commendation five times, the Navy Meritorious Unit Commendation four times, four battle stars for service in World War II, and eleven battle stars for service in Vietnam. 15 Apr 1944 Fleet aircraft carrier USS Hancock (CV-19) was commissioned with Captain Fred C. Dickey in command. 12 Oct 1944 Aircraft from USS Hancock attacked the Karenko Airfield in Karenko (now Hualien) in eastern Taiwan; nearly Japan Aluminum Company and Toho Metallury Company industrial facilities were also damaged. 28 Jan 1945 Air Group 80 was transferred aboard USS Hancock. 10 Feb 1945 USS Hancock departed Ulithi, Caroline Islands as part of Task Group 58.2. 11 Feb 1945 Aircraft of Air Group 80 flew training missions while its mothership USS Hancock sailed toward Japan. 12 Feb 1945 Aircraft of Air Group 80 flew training missions while its mothership USS Hancock sailed toward Japan. 16 Feb 1945 Air Group 80 flew 6 strikes fighter squadron 80 flew 1 strike against Tokyo, Japan (both groups from USS Hancock); 3 men and 3 aircraft were lost. 17 Feb 1945 Air Group 80 aircraft from USS Hancock flew 2 strikes against Tokyo, Japan; no men and no aircraft were lost. 19 Feb 1945 Air Group 80 flew 2 strikes against Iwo Jima and fighter squadron 80 flew 1 strike against Chichi Jima and Haha Jima (both groups from USS Hancock); 1 aircraft was lost. 21 Feb 1945 Air Group 80 from USS Hancock flew one strike in support of operations on Iwo Jima; 1 aircraft was lost. 22 Feb 1945 Air Group 80 from USS Hancock flew one strike in support of operations on Iwo Jima; 1 aircraft was lost. 25 Feb 1945 Fighter quadron VF-80 from USS Hancock flew one fighter sweep against Tokyo, Japan; no aircraft were lost. 1 Mar 1945 Air Group 80 from USS Hancock flew 4 strikes and fighter sqaudron VF-80 flew 1 strike against Amami Oshima, Ryuku Islands; no aircraft were lost. 4 Mar 1945 USS Hancock arrived at Ulithi, Caroline Islands; Air Group 6 relieved Air Group 80. 9 Mar 1945 Air Group 80 was officially detached from USS Hancock. 9 May 1947 Hancock was decommissioned from service. Hey, lad. My dad was also in Air Group Six. He was a pilot in Torpedo Squadron Six. The Air Group printed a book about the Air group's war cruises. They had three cruises all together. If you are willing to give me your dad's name I will see if the book has his picture. Lad, my dad was also a member of Air Group Six. He was a Torpedo pilot with VT-6. At the end of the war Air Group 6 put out a book on all the cruises the group had. They had three. If you would be willing to give me your dad's name, I'll see if his pictiue is in the book. I had a great uncle on USS Hancock. His name was Thomas Boyce. He was with VT 9. If anybody knows any stories about VT 9 or Thomas Boyce please put it on the noard.